We'd like to welcome all our friends making the transition from Ning to Spruz. The Spruz Owners' Community is full of members who are ready to help you in anyway they can, be it answering questions about the Spruz platform, giving you advice and feedback on your site, or simply supporting you along the way. Free sites are built into our business model and we realize that without them we wouldn't exist. With that in mind we've taken extra lengths to ensure everything we do is sustainable; no need to worry about moving ever again! Spruz was created by two guys that knew they had to work hard to create an easy to use but powerful site building platform. We've grown since then, but it's all been a natural process. That means there are no big shot investors holding a paycheck over our heads; we listen to the community and the community alone! Our work on the Spruz platform is never done. We have hundreds of ideas for the future, many of which come straight from the community. The entire Spruz team is open to your suggestions on how we can make using our platform a better experience for all those involved. Don't have a site yet? Get started! - Use the Ning Migration Tool to make it easy for your members to find your new Spruz website. - Stop by our Ning Refugees forum and get help with transitioning your website or provide feedback on the Spruz platform. - Learn more about using Access Levels to structure your website. Full Ning Data Importing is finally here! As the saying goes "Better Late than never", we are happy to report our Ning Data Importer is finally online! 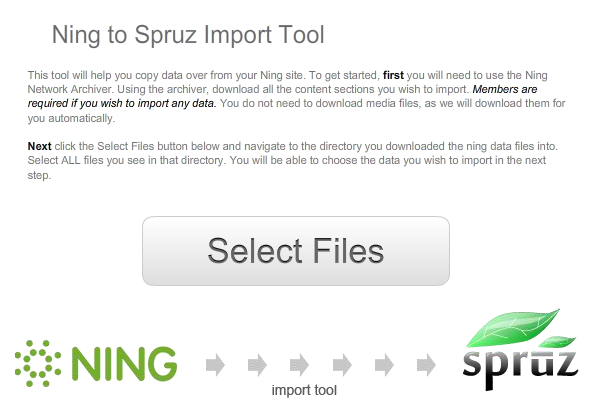 To import your Ning data you will go to import.spruz.com , login with your email address and password, and when prompted join the website. Our import website allows us to centralize information about the import process and will be used to import data from Social Go and Grou.ps in the very near future. Once you are logged in you can click on the Ning Import link to start your data import process. Before starting make sure you have all your information exported from your Ning website. The process of developing an import for the Ning data was a huge challenge due to continuous issues we discovered with the Ning Data files, but we are happy our development team was able to work around most issues. At this time we also wanted to update you on the status of other features in development and update their timelines. SPL (Spruz Platform Language) and API (Application Programming Interface) release - Opening up the platform for 3rd party developers has always been in our plan, and I am happy to report that we are closer then ever with the full release of our SPI documentation, new API interface and App Library. Estimated Release date for full SPI Documentation 4-5 weeks and our API 6-9 weeks. Content Settings - Content settings is a new section that will be added to the Site Settings area to give you more detailed control over your website features. Content settings will allow you to control comment box features, ability to customize the sharing and rating features on Videos, Photos Etc., member file space limit settings, and more. Estimated release date 2-5 weeks. Content Templates - This a progression update that is in progress now. Content templates in time will allow you to control all system text within your website. This system can also be used to change the language of system text. Part of this update also includes a new setting that is soon to be added to your site settings that will allow you to control the character set your website uses to display content. We want to remind everyone that if you encounter issues with the import tools please report the issue in the forums of our data import site . This helps your members register quickly on your new Spruz website, when a member is logged in and clicks the Migration Link or Button on your old Ning website, their profile information like Name, Age, Location, and Profile Photo will be copied over when they register on your new Spruz website, leaving only the email address and password the would need to fill out. It came as a big surprise to a lot of people when Ning announced yesterday that it would be ending it’s free service. But don't worry Ning users! Spruz welcomes you to a platform that has many of the same features and a strong track record. 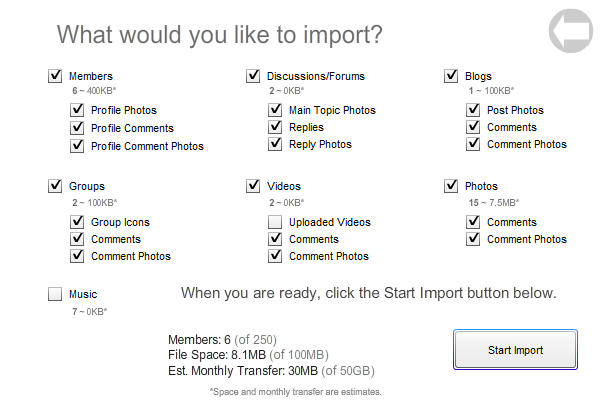 Easily use our Invite Feature to import your members from Ning. Need help, we will even do it for you ! 100's of Features, and we are continually adding more. You are not locked in, you can export your data. We don't have the overhead or investors dictating our path, we are a company for the community. We have already tried premium only, only to find out it is a mistake! Free websites help a web company grow virally. We have the right balance of Free and Premium offerings to ensure we will stay in business for aeons, because we are already profitable! With that said we would like to officially roll out the welcome mat to our new friends coming over from Ning. We will continue innovating and leading the way in social network technology. You are FREE to stay as long as you like! It came as a big surprise to a lot of people when Ning announced yesterday that it would be ending it’s free service. However it just proved what we have known for a while now: Ning’s free strategy was not sustainable and this kind of implosion was inevitable. Since we knew this day would come, we at Spruz have been working for the past 6 months to strengthen our free offering into a highly sustainable one. In this way we can continue offering high quality free social networks to our members indefinitely and provide large value upgrades to owners that need them.